Welcome to Drifgard wary traveler or a future settler! Drifgard is a town nestled deep in Brudvir lands and imbued with Brudvir spirit. Despite us being more isolated and seem wild to newcomers, we aim to provide its citizens and visitors amiable and friendly environment, making sure city is well secured, its residents have enough food, cozy home and a place to pursue their dreams in Chronicles of Elyria. Regardless whether you want to be a master blacksmith, valiant knight or just a humble innkeep, Drifgard welcomes any honest citizens and travelers to make it their home or a even just a stop on their travels. As a mayor I will do my best to make sure that the city evolves, while helping its members reach their individual goals, and those who contribute towards the welfare of the city can expect extended support in return. Keep in mind that nothing is set until land selection, plans regarding biomes and tribes may change, this is just what settlement will aim for or considers as possibility. Goals of the settlement will stay the same regardless of biome. Drifgard aims to settle in northern lands of boreal forests, lands native to Brudvir, preferably with vast forests nearby. 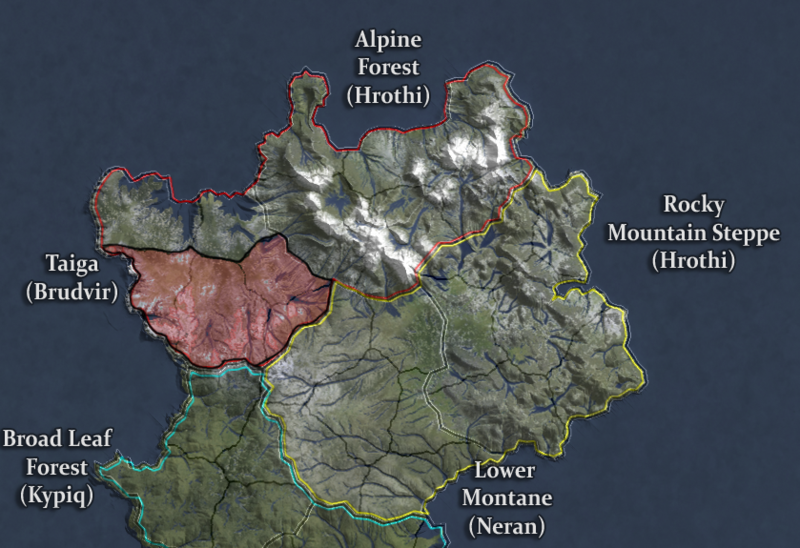 We expect the main tribe to be Brudvir, with a high chance of Hrothi and/or Neran population. Regardless of what the local population will comprise of, we will welcome any tribes willing to travel and settle with us. 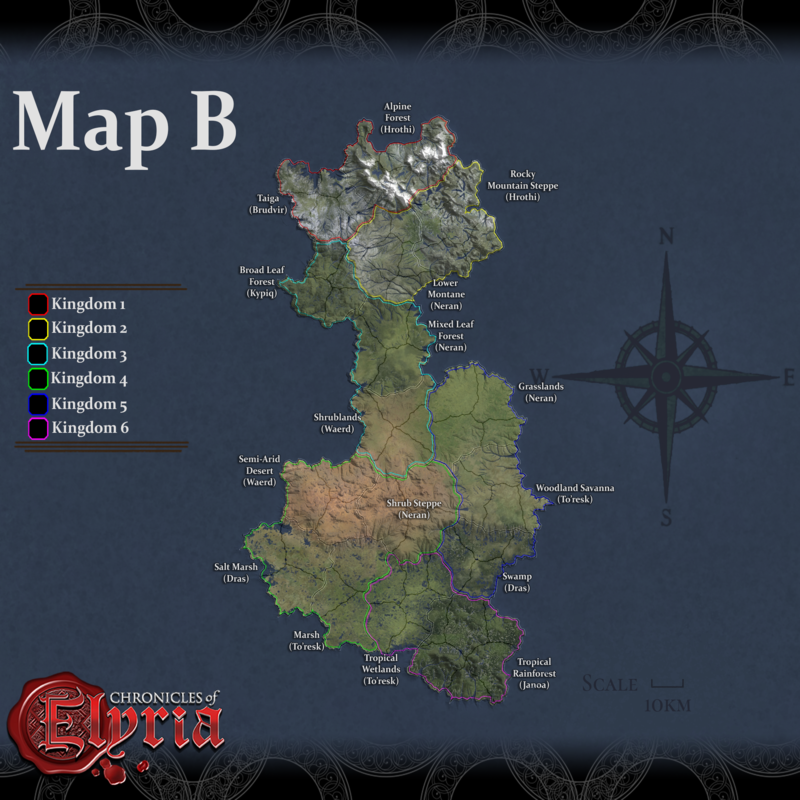 With map selection over and resulting in Selene playing the game on Map B we now have visual example of where kingdoms and biomes will be located. As it stands now, Drifgard is looking to settle somewhere in this area. Due to this, we may expect kypiq living near (or rather not far from) us. For those who want to settle in Drifgard but is interested in kypiq tribe, migration of that tribe will be easily achievable. For those who are interested in tribes that are located further away, we already have few members who are looking for migrating those to Drifgard or nearby areas, you are always welcome to join them in their adventures, making your journey easier. Drifgard aims to be a peaceful settlement, focusing heavily on the PvE aspects of CoE, this will mainly involve: Gathering, crafting, research, providing housing for players and much more. One of the major goals Drifgard will have is food production. Making sure city is well fed and being able to trading excess food with other nearby cities is a major goal and will allow us to bring in extra resources and provide us with protection from local baronies in exchange for food supplies. Note - Brudvir lands may have limited farming, excluding traditional farms, we will however try to farm whatever will be available, be that herbs, berries, mushrooms or something else. Town will be also utilizing resources of surrounding area to further support expansion and development of city and the trade. Forestry will be second main industry along with foraging. Furthermore Drifgard will aim to utilize all incoming raw materials to fullest, employing and supporting wide area or crafting professions to produce items and and supplies. And finally, you're always welcome to work for the town and pursue your goals in one of the openings available, or start your own business within the city. Also note that any individual or guild who feel at home or would like a place within our city are always welcome. To reach its goals and have a good infrastructure, Drifgard aims to have following buildings and professions. Keep in mind that some things may change depending on resource, building and land availability. Hunters Lodge - Hunters, Tamers, Trappers. Logging Camp - Lumberjacks, Foresters. Leatherworking Workshop - Leatherworkers, Tanners. Tailors Workshop - Weavers, Tailors. Carpenter Workshop - Carpenters, Fletchers, General Woodworkers. Stoneworking Workshop - Potters, Sculptors, Masons. Inn/Tavern - Innkeepers, Waiters, Bards. Shops - Store managers, Merchants. Adventurer's Guildhall - Adventurers, Cartographers, Explorers, Archeologists and more. Additionally Drifgard aims to have plenty of housing available for purchase or rent, allowing its residents and visitors to settle in Drifgard permanently or for a while. Guard Barracks - Guards, Bounty Hunters, Soldiers, Rangers. It's hard to list every planned and available profession and building, but we welcome a wide range of settlers, so if you are unsure of something, stop by our discord to discuss it! Drifgard will not focus on offensive PvP, instead it will have heavy focus on city defenses. During Exposition, additional defenses that are required will be built. The settlement will have its own NPC guards and any players who are willing to work as a guard, either full or part time are welcome. All guards will be paid and supplied with equipment accordingly. City protection will also come from nearby baronies that will be supplied with food in return. Those who are looking for more PvP oriented gameplay can always sign up with Gladalian Military and have a home in Drifgard. In addition: Every permanent resident will be required to have basic combat training in case of an emergency. Currently it is hard to predict much about religion as there is limited information on the matter, however, Drifgard will follow Faedin religion, and have some buildings in support of that. Ideally Drifgard will not ban any other religions, and while individuals will not be allowed to actively promote them, people are free to keep practicing other religions as long as they keep it to themselves and it does not harm locals. This includes being agnostic and being in a cult. However, if game mechanics will penalize heavily for having other religions or lack of main one, this may change and Faedin may be enforced more heavily. However, we won’t ever enforce religion for RP or any purpose unless it provides us with a tangible benefit to all citizens. Drifgard will not focus on RP, however it is also not against it, in the end I expect overall theme to vary from Light RP to No RP. Crimson Adventurers - Association for adventurers, travelers, cartographers, explorers and many others. Providing freedom to explore at your own pace and helping those that strive to push for new horizons. Dragon's Tooth - Smithing guild that focuses on every aspect when it comes to crafting armor and weapons or working with metal. As such guild includes miners, tinkerers, carpenters and leatherworkers. Seems pretty nice ;P It would be cool if it were possible to turn it into a big trade center. If I hadn't got a home already in Arborg I would consider living there, seriously. Sounds great. Looks great, glad to have such a settlement as part of Tryggr! Happy to announce that Drifgard is now a part of Demalion Empire. Proud to announce that Crimson Adventurers’ Guild will be based in Drifgard. A friendly reminder - Drifgard also welcomes any honest groups or individuals who are looking to start, or already have an established organization. You will always find a place and support in the city.